As a business driven by landscape and yard design it wasn’t a far leap for them to choose and sell their ideal grill to be incorporated into their designs. Requesting trade show printing they needed an advertising piece that would stand out among all other pieces customers would get as they walked from booth to booth. 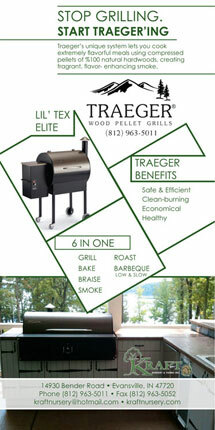 As a distributor of Traeger Grills Kraft Nursery and Farms wanted a promotional piece that would feature key aspects of the grill as well as inform people they could be purchased locally in Evansville, IN. When designing trade show printing, sometimes the absence of color helps a piece to stand out more. In this single panel brochure I chose to use a deeper green that I sampled from the Kraft Nursery and Farms Logo. Deepening the green helped make the text and linear elements stand out. Again, using white space to offset the text made the piece easier to read as well as showcasing the grills. I also chose to print this single panel brochure on a high gloss thick stock to further help it stand out in the hand fulls of advertising materials their potential customers would get at this trade show.